Live poker tournaments regularly take place in many casinos and poker rooms all over the world. There must be literally thousands, if not hundreds of thousands, of them held every year. The collective number of live tournaments is significantly lower than the collective number of online tournaments, and there isn't anywhere near the same variety either, but there are certainly still plenty to choose from. It's fair to say that the majority of live tournaments are relatively modest affairs, with reasonable sized buy ins and fairly small fields made up mostly of local players. Larger tournaments are not uncommon, but they do form the minority. In most poker rooms you are far more likely to see a tournament with a $50 buy in than one with a $500 buy in. In addition to all the "normal" live poker tournaments that take place, there are also a number of high profile events too. These generally attract many of the top poker players from around the world, and typically come with high buy ins and prize pools to match. Just playing in a live tournament of this type, never mind actually winning one, is the ultimate ambition of many poker players. 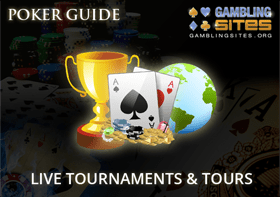 On this page you will find details on several major live poker tournaments, including the World Series of Poker and the World Poker Tour. There is also some advice on how you can qualify for these events without having to come up with a large entry fee, and a few tips for playing in them. The World Series of Poker (WSOP) is the biggest annual poker event in the world. It takes place over a period of several weeks spanning June and July, and features a range of different tournaments culminating in the Main Event. It has evolved significantly since it started back in 1970, and has grown in terms of both the number of tournaments taking place and the number of entrants taking part. Entrance to the very first WSOP was by invitation only, with just seven of the top players of that time invited to take part. The event was organized by Benny Binion, and held in the Horseshoe Casino (which he owned). It took the form of a cash game rather than a tournament, with a fixed start and finish time. The winner, Johnny Moss, was determined by a vote. The following year's WSOP, which was also won by Johnny Moss, was played as a Texas Hold'em freezeout tournament. Once again just seven players took part, paying a $5,000 buy in for the privilege. The buy in was increased to $10,000 in 1972, and that has remained the cost to enter the WSOP Main Event ever since. Other tournaments were added to the WSOP in 1973, and the event slowly began to grow. The WSOP of today is barely recognizable to the early days. The event is now owned and sponsored by Caesars Entertainment, and it is held at the Rio Hotel and Casino. The Main Event alone attracts thousands of entrants, with first place carrying a cash prize of several million dollars. Many more players take part in the dozens of different tournaments which now make up the series, and the event attracts large television audiences. The World Poker Tour (WPT) combines a series of tournaments that take place in locations all over the world. Many of the events are held in the United States, with other locations including Canada, Holland, Korea, and the United Kingdom. The exact schedule of tournaments changes from one year to the next, but always culminates with the WPT World Championship. The first WPT season started with the $10,000 buy in Five Diamond World Poker Classic, held in June 2002. It ran until April of the following year, when the $25,000 buy in WPT World Championship took place at the Bellagio Resort & Casino. The following seasons all followed a similar timetable, taking place through the latter part of one year and the early part of the next. A WPT season usually includes around 15 to 20 tournaments on the main tour, with buy ins currently ranging from $3,500 to $20,000. There are other events in addition to the main tour, such as the WPT Alpha8 series. This series consists of several high roller tournaments, with buy ins starting at $100,000. Other WPT events are as follows. The European Poker Tour is an annual series of events that are held in major cities throughout Europe. The tour schedule varies each year, as do the locations where the events take place. Frequently used locations include London, Dublin, Barcelona and Prague. Since the tour was founded in 2004 it has featured an average of roughly ten events each season. The main tournament at each EPT event usually has a buy in of around €5,000, although there have been some higher stakes tournaments too. Each event generally includes a number of side events, with smaller buy ins. The UK & Ireland Poker Tour (UKIPT) has been running annually since 2009. Like most other tours, the exact schedule changes annually, with up to ten events taking place in venues throughout England, Scotland, and Ireland. Occasional events have taken place in Spain too. The average buy in for a UKIPT tournament is around £800. The Latin America Poker Tour (LAPT) was run for its first season in 2008. It initially featured just three events – in Brazil, Costa Rica, and Uruguay. The tour has been expanded a little since then, taking in locations including Argentina, Peru, Colombia, and Chile. The tournaments have buy ins of between $1,500 and $3,000, and usually attract fields of between 500 and 1,000 players. The Asia Pacific Tour (APPT) was the first major poker series in this region when it launched in 2007, and it remains the biggest. Having started with a schedule of just four events, it peaked with 12 in 2014. The tour takes credit for organizing the first government sanctioned large scale poker tournaments in both China and Korea, and has helped to greatly improve the overall profile of poker in this part of the world. Part of the APPT detailed above, the Aussie Millions series of tournaments is worthy of a mention in its own right. Previously known as the Australian Poker Championship, it is one of the highest profile annual poker events held outside the United States. The Main Event is the largest poker tournament in the Southern Hemisphere based on the size of its prize pool. The Aussie Millions takes place each year at the Crown Casino in Melbourne, Australia. In addition to the Main Event, it features a number of other tournaments as well. It is particularly well known for its high stakes events, which have included the $100,000 Challenge and the $250,000 Super High Roller. The Irish Open doesn't have quite the same high profile as many of the other tournaments and tours listed here, but it can definitely be considered a major event on the international poker calendar. It has a history dating back to 1981, and it is in fact the longest running annual Texas Hold'em tournament in Europe and the second longest running in the world after the WSOP. Sponsored by the Irish bookmakers Paddy Power since 2005, the Irish Open experienced significant growth during the online poker boom. It consistently attracts hundreds of entrants, and is widely regarded as one of the most enjoyable and atmospheric poker tournaments to play in. Most of the poker events that we have detailed above cost sizable sums of money to enter. The buy ins are usually at least a few hundred dollars, and often as high as a few thousand. This is why the fields are typically made up mostly of serious players. These players not only have the skills necessary to do well in the big tournaments, they also have the bankrolls to support playing in them. However, this is not to say that you shouldn't aspire to playing in a major tournament even if you don't really have the bankroll to do so with any degree of regularity. If you can afford the entry fee, and any costs associated with actually getting to the tournament and taking part, then there is absolutely nothing wrong with taking a shot at the big time. There is also a way to gain entry into a major event without having to come up with a large buy in, and that's by entering satellite tournaments. If you're not familiar with what satellite tournaments are, they are basically tournaments where the prize pool is made up of one or more entries into other (larger tournaments). Many of the venues that host the big tournaments run satellites in the lead up to them, and a number of online poker sites also run satellites for live events. These make it possible to qualify for a major live poker tournament for a fraction of the buy in. It's worth noting that one of poker's greatest stories involves a player who qualified for a major tournament by playing in a satellite. In 2003, Chris Moneymaker won a seat at the WSOP Main Event after playing in an online satellite that had cost him just $40. That in itself was a solid achievement, but he actually went on to win the biggest poker tournament in the world – for a cool $2.5 million. Winning a major live tournament, or even just finishing in the first few positions, can be life changing. Some of the prize pools run into many millions of dollars, and with a decent finish you might win sums of money that you could only dream of. You'll have to play well though, as you'll be up against top opposition, and you'll probably need more than a little good fortune too. This doesn't mean you have to be an amazing poker player just to stand a chance however. Obviously the top players are generally the ones that do consistently well in the big tournaments, but it is not at all uncommon for an outsider to make a final table or even win one. The overall standard of the opposition you will face in a major live tournament will be high of course, but the strategies involved are largely the same as they are for any other tournament. If you have a solid understanding of poker strategy then there is no reason why you can't go on a deep run. Poker tournament strategy is a complex subject so we won't get into the detail of it here. We do, however, have a few simple tips that we'd recommend you follow. These are not part of some magic formula that is guaranteed to make you do well, but they may well help your overall chances. At major live events there is often a lot going on. There may be a lot of noise coming from the chatter at all the tables, there may be spectators watching and commenting from the rail, and there may even be television cameras filming the action. You need to try to ignore all of this and just concentrate on the most important thing. You are there to play poker, and that is what you should be focused on. When you sit down at the table in a major tournament for the first time, or any other time for that matter, you may well start to have some doubts about whether you have what it takes to do well. That's normal, but you should try to ignore any doubts you may have. It doesn't matter if you are inexperienced at this level of the game, the nature of poker is such that you always have a chance of winning. Confidence and belief are important, as you don't want to be second guessing yourself every time you have a decision to make. Players often feel the need to make some kind of amazing move when they are playing in a major live event. It is not at all uncommon for players to try to pull off huge bluffs they wouldn't normally even consider, make hero calls against a "big name", or just generally attempt tricky plays that aren't really necessary. Acting in this way may well get you noticed, but that doesn't make it a good ploy. You're much better off just sticking to solid, simple play for the most part. There will probably be some occasions when you need to mix up your game a bit, but you shouldn't do it just for the sake of it. When playing in a major tournament, particularly for the first time, it can be tempting to play safe and just try to survive as long as possible. This is not the right approach in our opinion. Even though just finishing in the money might mean a substantial payday, making that your goal will hurt your overall play. You should forget the money involved, and play the same way you would in any tournament. You might well be up against "better" players, but if you can consistently make the right decisions then there is no reason why you can't take first place.